The digital Media Learning conference in Long Beach has an open call for submissions that ends November 1. The committee invites workshop, panel proposals, five minute talks and student volunteers. The conference will be held in Long Beach California. 1. What are the central concerns shaping learning within peer-based, participatory, open ecologies? What are the new collectives (including hybrid public institutional models) that are emerging in today’s open learning ecologies? How is learning happening in user-innovation communities? How does remix, mentorship, sharing, and exchange occur? How do issues such as cyberbullying, problematic content, and privacy shape participation in these ecologies? How is diversity shaping learning constituencies? What forms of identities become possible? What are the relationships between different stakeholders, such as learner-centered partnerships and collaborations between teachers, administrators, students, institutions, policy makers, researchers, and designers? 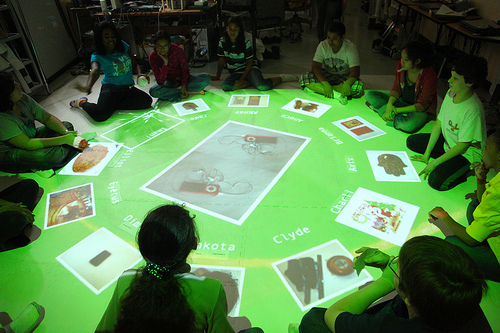 What are the design-driven pedagogies and learning models we should explore? What is the role of embedded assessment in understanding learning? How do we understand flow and engagement? 2. What is the knowledge base required of designers, researchers, and practitioners working on peer-based, participatory, open learning ecologies today? What is missing? What new forms of knowledge need to be developed? What existing frameworks need to be rethought? 3. What core socio-technical practices are shaping (or have the potential to shape) the future of learning? What practices may be impeding innovation or getting in the way of learning? How can and should knowledge about practices shape policy, design, and implementation of innovations?